Bring the fun and excitement of a Forever Captured photo booth rental to your Christmas or holiday party and forever capture the laughs, the memories, priceless moments, and hysterical antics of your guests in a photobooth. Your Christmas party or event may only last an evening, but a Forever Captured photo booth captures delightful memories for both you and your guests that will last for many years to come. People love to take home souvenirs of themselves. Photo booth pictures are the ultimate Christmas party favor. People put these photo booth pictures on their fridge or office cubical wall, and they literally stay there for years – a constant connection to their memories of an amazing day. People of all ages have a lot of fun. The booth provides your guests with something really fun and memorable to do together, and with our extensive selection of photo booth props, your guests will find no end to inspiration for having a great time. In many ways, a booth actually does what only the most talented photographers can do – only it’s cheaper. Click here to learn more. Our high tech, open concept booth. Unlimited photos. Each individual photo session prints as either two 2×6 inch photo strips or one 4×6 inch print. Choice of a backdrop for the photos. You can even choose our green screen which allows you to choose any image as the photo backdrop. A green screen allows your guests to have their photo set almost anywhere. Built in studio grading lighting so your guest’s pictures always look the best. Large touch screen live view monitor so guests can see themselves pose and stage fantastic pictures. Top quality keepsakes for every one of your guests. Every guest will receive a lab quality, high resolution photo strip or a grouping of photos printed in postcard style of them having a great time. Each photo layout prints within 10 seconds as professional grad, smudge proof photos that should last 100 years. 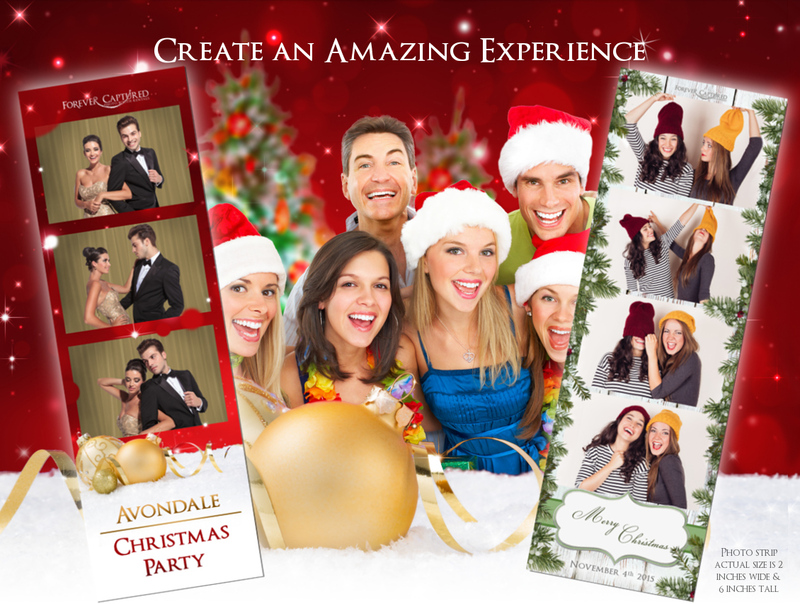 We ensure photo booth design and layout are customized for all Christmas parties that we do. You can add a special message, your Christmas party’s name, company logo, or special graphics. Check out the different photo layouts you can choose from when you rent one of our booths. Our photo layouts are among the best offered in North America. Guests can email their photos to friends or share them on Facebook, Twitter, Pinterest, and other places from our compact social sharing kiosk. Deluxe Prop Box with a wide selection of fun and interesting props for your guests to choose from. Friendly, professional, on-site photo booth attendant throughout the entire duration of your Christmas party. Delivery of the booth to your Christmas party. Complete setup and take down of the photobooth. You do nothing but smile for your photo and have a great time. Online gallery of all photos taken. Photos are uploaded to the gallery after the Christmas party. Your gallery can be public or private. It’s your choice. A keepsake for you: a USB stick with all of your guests’ photos (if you’d like one). We rent our photo booth by the hour and always include all the great features listed above. Rentals start at $549 for 2 hours. Please contact us to see if we are available for your event or for rentals that are longer than 2 hours. So if you are looking for a photo booth rental for your Christmas or holiday party or event, Forever Captured PhotoBooth can help you create an amazing experience that your guests will love and remember for years to come. Contact us today, and we can begin talking about what you have in mind for your party or event. Contact us at info@forevercaptured.ca or at .